Astronomers have been weighing options for how to identify the existence of life on other planets and moons in our solar system. There are a range of possibilities. 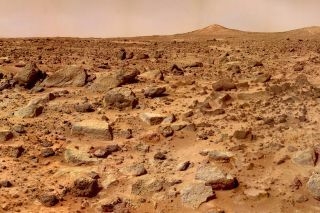 Mars could be host to ancient or current life, depending on how much water flows on the surface and how salty it is. There are also many icy moons (some with water geysers) in the outer regions of our solar system — among them Saturn's Titan and Enceladus, and Jupiter's Europa and Ganymede. "This observation appears to be trivial," he went on, "but it potentially allows [us] to detect extra-terrestrial life that differs from known life." But given that the Earth is about 4.5 billion years old, critics of these discoveries argue, the changes in Earth's geology over billions of years can sometimes mimic the appearances of lifeforms. Microbiologists therefore need to prove that the older lifeforms did indeed exist by comparing the older fossils to much younger and better-verified examples of life. Researchers must also attempt to verify markings by life against the chemistry in the rocks, although again this can be altered by rock deformation over time. Baucon is a member of ROSAE, an Italian acronym that in English stands for Organism-Sediment Relationships in Extreme Environments. It's a scientific project that looks at how organisms and sediments interact in so-called "extreme environments," such as the deep sea. In this latest study, Baucon and his colleagues attempt to explain the best way to find extra-terrestrial traces. One method could be looking for "meandering" trails and burrows, which is an efficient way for microorganisms to look for food. Rather than making straight lines in an environment or repeatedly crossing a surface, the meandering allows a creature to search for food without exerting too much energy. "Rangers look for tracks on the snow to determine the presence of elusive animals such as the lynx," said Baucon, pointing out that the traces work for creatures ranging from microscopic organisms to large dinosaurs. "Why not to do the same with alien tracks, borings, and burrows?" "Traces of interactions with the substrate" — the natural environment for a creature — "are a common evidence for life on Earth, and their fossils can survive the humongous pressures and temperatures generated by colliding continents," he added.